Note: Only one person may log in to access your site or document using an invitation you send. However, the person who gets your invitation may decide to not use it, and instead forward the invitation to someone else who can then log in using their Microsoft account or work account to access the site or document. Note: Your global administrator must enable external sharing and set the appropriate permissions before you can share sites or documents. 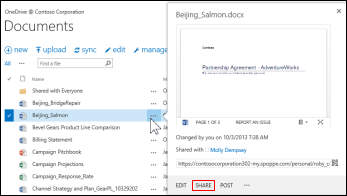 See Manage external sharing for your SharePoint online environment for more information. An external user is someone outside your organization who can access your SharePoint Online sites and documents but does not have a license for your SharePoint Online or Microsoft Office 365 subscription. External users are not employees, contractors, or onsite agents for you or your affiliates. External users inherit the use rights of the SharePoint Online customer who is inviting them to collaborate. That is, if an organization purchases an E3 Enterprise plan, and builds a site that uses enterprise features, the external user is granted rights to use and/or view the enterprise features within the site they are invited to. While external users can be invited as extended project members to perform a full range of actions on a site, they will not have the exact same capabilities as a full, paid, licensed member within your organization. See Manage external sharing for your SharePoint online environment for more information. In the Share dialog box, type the names of the external users you want to invite. For example: someone@outlook.com or someone@contoso.com. Note: You can also use the Share command to grant internal licensed users access to a site. If you want to do this, just type the names of the people you want to invite. Note: If you get an unmatched user error message when you enter a name and email address, your site might not be enabled to allow external users. Check with your administrator to enable it. You can create an anonymous guest link, and then share the link using whatever media suits you. For example, post it on a social media page, or paste it into an email. You can create a guest link that provides editing permission or only viewing permission. You must be a Site Owner or have full control permissions to share a document with external users. Additionally, the external sharing feature must be turned on in either the Office 365 Service Settings or the SharePoint Online admin center (depending on which plan you have). External sharing must also be turned on for your site collection (enterprise plans only). Click the ellipses ... next to the document, and then click Share. In the Share dialog box, click Get a link. Select the type of permission you want to grant: Restricted link, View link, or Edit link. A guest link URL is created. Select the guest link URL and copy it. You can now paste the guest link URL into the media of your choice. 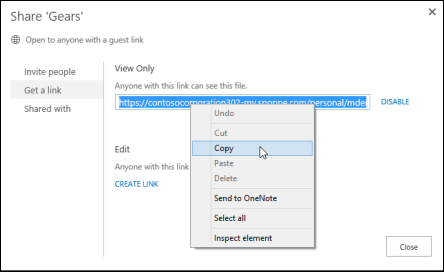 If a document is in a team site library, other site members can find the guest links in the Share dialog box and send them to others. If the file you are attempting to share is located in a library that is using Information Rights Management, you will not be able to share it externally. Anonymous guest links could potentially be forwarded or shared with other people, who might also be able to view or edit the content without signing in. Avoid using anonymous guest links for sensitive content. People who are invited to access documents using anonymous guest links will only be able to view or read files in the relevant Office Online. They will not be able to open files in a corresponding desktop version of the Office program. If external sharing is turned off globally in the Office 365 Service Settings or the SharePoint Online Admin center, any shared links will stop working. If the feature is later reactivated, these links will resume working. It is also possible to disable individual links that have been shared if you want to revoke access to a specific document. See Disable an anonymous guest link. If you share Excel workbooks that include Power View sheets with people outside your organization, they won't be able to see the Power View sheets in those workbooks. You may be happy to share some documents widely, and in fact you may want to encourage people to reshare them. For such documents you can allow people to create anonymous guest links with documents you share with them. To allow this capability, you must have full control permission. Go to the library where you want to allow people to create guest links. Click Site permissions under the Users and Permissions section. Note: If you don't see Access Request Settings, click Managing Parent under the Permissions tab, and then click Access Request Settings. In the Access Requests Settings dialog box, check Allow members to share the site and individual files and folders. Optionally, check Allow access requests and add an email address that will receive access requests. Now when people select documents you’ve shared with them and open the Share dialog box, they can create a guest link. Note, however, that they can only create guest links that allow guests to edit the document if you gave them edit permission when you first shared the document. If they only have view permission, they can only create guest links that allow view permission. For an overview of Access Request Settings, see Video: Share a site without access request. Navigate to the site and document you want to share. Click the ellipses (...) next to the document, and then click Share. Click Invite people if it's not already selected, and then type the email addresses of people you’re inviting to share the document. For example: someone@outlook.com, or somebody@gmail.com, or externaluser@contoso.com. In the drop-down list, select the permission level you’d like to grant these users: Can edit or Can view. If you want, type a message to be included with the email. The message might include information or instructions about the document you’ve shared. Some sites are customized and may not display Require sign-in. If you need this option, contact your site administrator. Note: If you don’t select the Require sign-in check box, the email will contain an anonymous guest link to the document. Anonymous guest links could potentially be forwarded or shared with other people, who might also be able to view or edit the content without signing in. Click Send an email invitation. Note: Learn about changes to the SharePoint notification email address to prevent emails going to the recipient's Junk Email folder. You can also use the Share command to quickly see the list of people a document has been shared with. 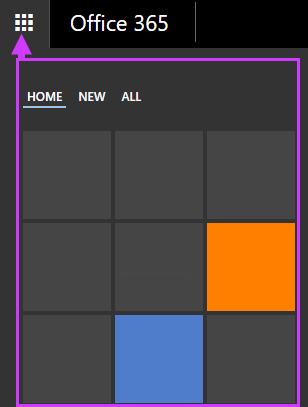 To see who has access to a site, click Share at the top right of the page. Click the link after Shared with in the Share dialog box to view a list of people who have access to the site. To see who has access to a document, folder, or Document Set, click the ellipses ... next to the document, click Share. and then click Shared With. Click People and groups under Users and Permissions. Select the group from the Quick Launch bar on the left which you want to remove users. Select the users you want to remove, click Actions and then click Remove Users from Group. You can see whether a document has been shared via guest link by checking the properties menu for the document. When asked if you want the link disabled, click Disable Link. When people outside your organization attempt to access the content using the guest link, they will get a message that says they can’t access it.